Please click image to see a larger version. Scroll down past the intro to see the rest of the photos. 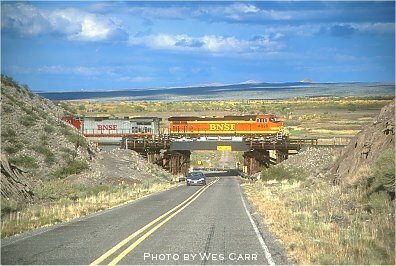 Often overlooked and seldom photographed, BNSF's former Santa Fe El Paso Subdivision, sometimes known as "the Horny Toad", stretches 240 miles from Albuquerque to El Paso. 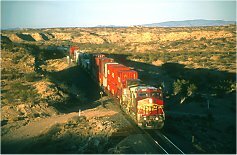 It's not hard to see why it's overlooked: the El Paso Sub hosts an average of three to five daily trains (not counting locals and roadswitchers), while BNSF's "transcon", the former Santa Fe route from Chicago to California which cuts through New Mexico's midsection from east to west, is host to several dozen. 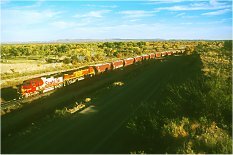 If you were a visitor from out of state and you wanted to spend a few days photographing BNSF trains, which line would you set your sights on? I thought so. 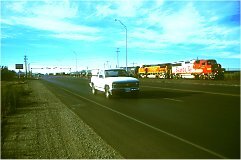 Yet, part of the charm and appeal of the El Paso Subdivision is in the dramatic difference in operations between it and the high-traffic, (mostly) double-tracked Clovis and Gallup Subdivisions. 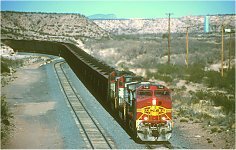 In contrast to BNSF's transcon trackage, the El Paso Sub has a real "down-home", branchline feel to it. 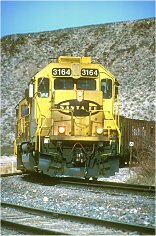 Dispatched by TWC (Track Warrant Control), and with not a block signal to be found anywhere south of Belen, the line features railroading at a more leisurely pace, with trains operating at a maximum speed of 49 mph. 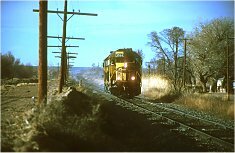 There are only a few long sidings scattered along the line, resulting in crews having to endure some loooong waits for opposing trains. 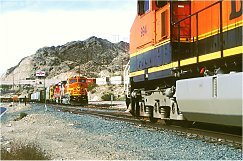 When a train pulls out of a siding, one crew member of the train will stay on the ground behind the train to line the switch back; the train will then back up (under the provisions of GCOR Rule 6.6) on the main track between the siding switches to pick him up on the head end! 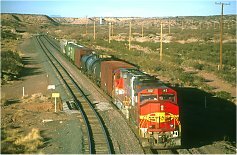 In other words, the El Paso Sub is simply a different BNSF than one experiences standing along the Clovis Sub at Willard or the Gallup Sub at Rio Puerco, watching a seemingly never-ending parade of intermodal trains rumble by at 70 miles per hour! 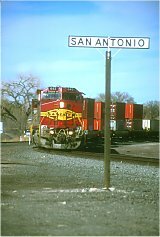 As far as traffic goes, locals pretty much make " all the stops " and even the through freights (the daily MBELELP and MELPBEL trains between Belen and El Paso) perform work at one or two locations along the way, usually Rincon and/or Vinton. 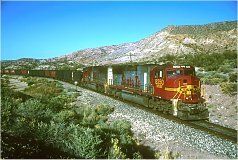 Also plying El Paso Sub rails -- in addition to locals and mixed freights -- are occasional unit trains loaded with grain destined to Mexico and unit vehicle trains loaded with Mexican-built autos. 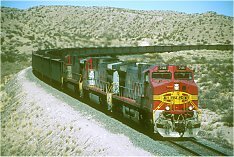 The El Paso Sub also hosts occasional unit coal trains, loaded with New Mexico coal destined for power plants in Arizona via the Union Pacific at Deming. 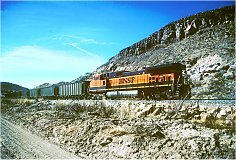 The coal trains diverge from the El Paso Sub at Rincon, travelling over the former BNSF Deming Subdivision (now operated by the Southwestern RR) to reach UP rails at Deming. Next time you're in New Mexico, come see why the El Paso Sub has an appeal all of its own. 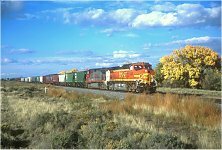 Spend a few days along the line, and you'll probably see a little bit of everything: coal, grain, manifest freight, locals, and maybe even a unit vehicle train. 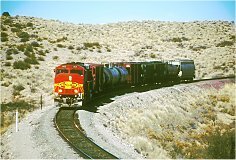 The trains -- when you can find 'em -- look as good down here as they do on the transcon. The scenery ain't bad, either. And...(shhhhh!...this is our little secret...) no one else is shooting photos down here! Please click any of the following thumbnails to see a larger image. 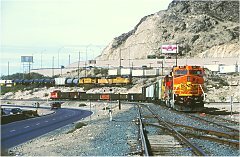 All photographs and text on this website © 2002 by Wes Carr.